Monday, I reviewed my preseason predictions from the AFC. This time around, I’ll continue with the NFC. Kamara cruised past the 250 benchmark with 194 carries and 81 receptions — 275 total — in just 15 games. This provides further evidence that 215 pounds is big enough for a workhorse back and makes him one of the top backs to draft in 2019. Elliott exploded for 77 catches, more than he had in his first two seasons combined. His three-year total of 64 RecYards Added is sixth-best at the position, which suggests that his new receiving workload should be here to stay. 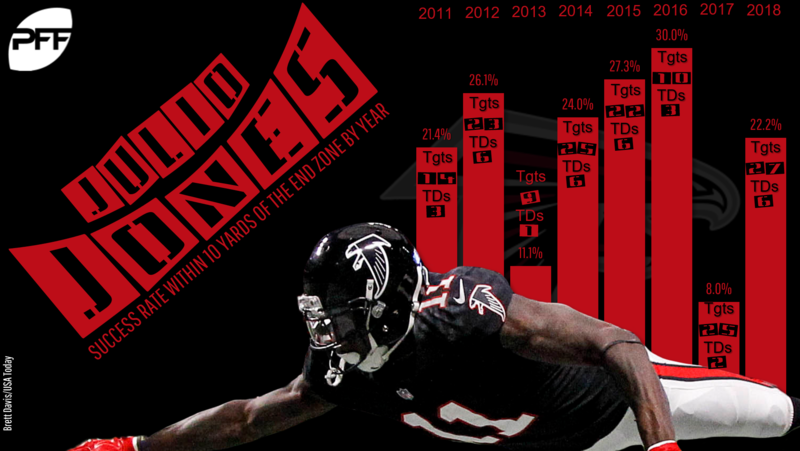 I don’t think I’ll ever understand how Jones managed just two touchdowns in 2017 on his 25 targets within 10 yards of the end zone. This was as cut-and-dried a case of statistical regression as there is, and Jones should expect around 8 touchdowns per year for as long as he can stay healthy and this effective. Even while Aaron Rodgers and the Packers failed to have their best years, Adams set career highs with 162 targets, 111 receptions, 1,386 yards, and 13 touchdowns. He was the No. 4 PPR receiver and has the fourth-most Yards Added at the position over the last three years. He’ll be a top-five choice in 2019. It was a slow build coming off of a two-game suspension and an abrupt end following a sprained MCL in Week 15, but in between Jones was one of the biggest breakout runners this season. Between Weeks 8 and 14, he was 11th at the position with 19.8 PPR points per game. I expect to rank him in my top-10 for 2019. Depending on the choice you made instead, this was likely my most damaging prediction. McCaffrey made teammate C.J. Anderson an afterthought as he racked up 1,098 rushing yards and 1,965 yards from scrimmage, third-most at the position. McCaffrey seemed like a totally different player this year, increasing his yards per attempt from 3.7 to 5.0, his yards after contact per attempt from 2.1 to 2.9, and his RuYards Added total from -45 to 27. He is in the mix for the top pick in 2019 drafts. 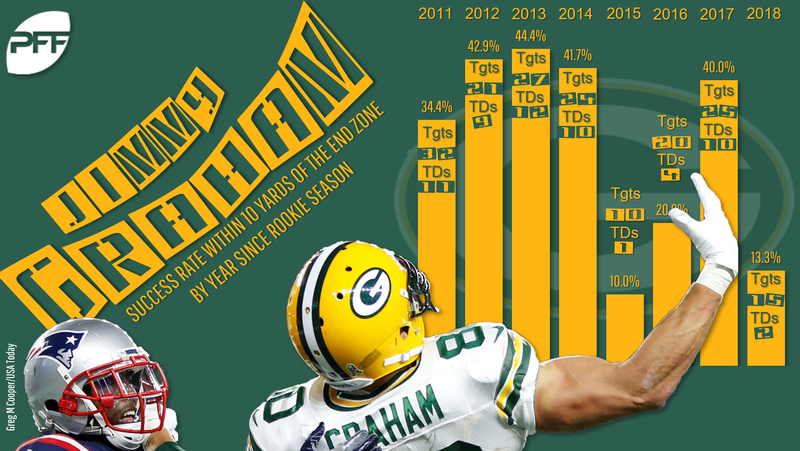 Graham continued his slow decline in catch volume with just 55 catches, his lowest total in a full season since his rookie year in 2010. The problem was Graham scored just two touchdowns and did so in a similar fashion to Julio Jones in 2017. With his size and with Aaron Rodgers throwing him the ball, Graham would be a no-brainer choice to bounce back in 2019. However, at 32 years old, I’m not sure regression can make up for his declining athleticism. The Lions offense took a major step back under new head coach Matt Patricia, so this may have come to pass independent of the team’s personnel. However, led by LeGarrette Blount and rookie Kerryon Johnson, the team ran the ball on 63.0% of its plays within five yards of the end zone. That is by far the highest rate of the Stafford era and makes him an unlikely candidate to bounce back in 2019. Breida was absolutely fantasy-relevant with 11.7 PPR points per game, 30th-best at the position. He likely would have been higher except for a handful of minor injuries that knocked him out of games. Like McCaffrey, Breida showed massive skill improvements compared to his rookie season. I’ll need to do more research before I decide whether that was a coincidence or whether the rookie-to-sophomore leap is predictable. Either way, Breida should be in the fantasy mix in 2019 even with Jerick McKinnon returning from his ACL tear. Robinson was outside the top-20 at 22nd in ADP at the position, so this may not have seemed like a bold prediction. However, his 11.9 PPR points per game was just 33rd-best among receivers and was worse than all but three of the receivers taken ahead of him — Larry Fizgerald (11.2), Doug Baldwin (10.9), and Demaryius Thomas (10.4). Robinson has been an inefficient player since his breakout 2015 season and is well cast in a distributed target split in Chicago. Evans is the more-extreme receiver version of Lamar Miller. Evans had turned in three straight seasons with -40 Yards Added or worse before he completely flipped the script with 40 Yards Added in 2018, seventh-best at the position. It’s probably less important for him to maintain that newfound efficiency than for Miller to because Evans can follow the A.J. Green model of heavy target volumes and touchdown scoring to fantasy success no matter how effective he really is. Howard broke out in a major way and was sixth at the position with 12.1 PPR points per game through 11 weeks when he suffered season-ending ankle and foot injuries. Tampa looks suddenly loaded with five receivers who added at least 10 yards in 2018, but Howard seems like a good bet to continue to thrive in 2019 because his size and speed make him and Evans the biggest matchup nightmares and red-zone weapons on the team. The Smith half of this prediction was definitively wrong. He averaged just 218 yards and 1 touchdown per game before he broke his leg in Week 10. However, I still consider this good advice because Cousins was 10 spots higher in ADP and really hurt you if you drafted him. He finished 16th at the position with 17.8 fantasy points per game and behind a slew of other options behind him in ADP including the top-three scorers of Patrick Mahomes (25.9 PPG, 16th ADP), Matt Ryan (22.0 PPG, 13th ADP), and Ben Roethlisberger (20.9 PPG, 11th ADP). Part of Manning’s appeal is his iron man nature, so hopefully you’ll forgive me for setting a moving target and calling his 17th-best seasonal total of 253 fantasy points a win when his 15.1 point-per-game average was just 25th-best. Thanks to the addition of Saquon Barkley and the return of Odell Beckham, Manning turned his best skill talent in years into a 66.0% completion percentage that was a career-best and 7.5 yards per attempt average that was his best since 2011. This prediction was motivated by the idea that Jamaal Williams and especially Aaron Jones could allow the Packers to run the ball more often to protect Rodgers, similar to what the Saints have done for Drew Brees. In that sense, this prediction was terribly wrong. Rodgers threw 597 passes, the second-most of his career. And that wasn’t simply the result of bad gamescripts requiring the pass. The Packers ran the ball on 40.6% of their plays with a lead and 28.0% of their plays while behind, both of which were lowest in the Rodgers era in Green Bay. Wentz regressed from 2.5 passing touchdowns per game to 1.9 this season. That was just half a score per game behind Andrew Luck in second place, but more than a touchdown behind Patrick Mahomes in first. Wentz may have slightly underwhelmed in fantasy this season, but his career-best 69.6% completion percentage and 7.7 yards per attempt have me bullish on his fantasy future whatever happens with him and Nick Foles. 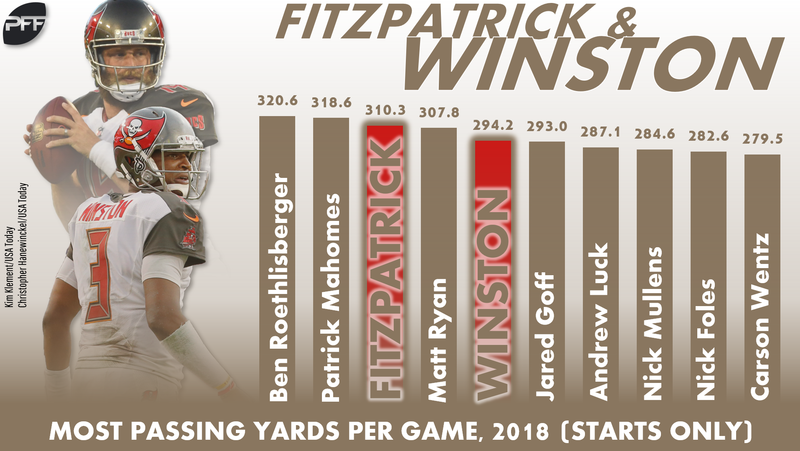 Winston and teammate Ryan Fitzpatrick finished fifth and third with 294 and 314 respective passing yards per game in their starts. That similar success hints at the relative strength of the Buccaneers’ receiving weapons, which was one of the major motivators of this prediction. Winston’s decision-making could cost him his job any season now, but he should continue to be a fantasy asset as long as he’s starting in Tampa. Foot and groin injuries that landed Freeman on injured reserve in Week 5 locked up this prediction, but for future consideration, I think it was encouraging to see Coleman survive a season with 199 total touches. As an unrestricted free agent, he will have a chance to land an expanded role on another team and maintain his RB2 status from 2018. I think I have my answer on whether my confidence matches the likelihood of my predictions. I had a red-letter season getting 9 of my 10 “very confident” predictions correct, but I fared much worse as soon as any doubt crept in. In fact, I was no more likely to be correct with my self-ascribed “pretty confident” picks as I was with my “not very confident” picks. I find that illuminating and will consider it as I make future predictions. As for specifics, I can’t identify any broad trends that led to systematically correct or incorrect predictions. I relied heavily on my Yards Added metrics to predict workload changes I felt would follow player effectiveness, and that led to some big hits like Ezekiel Elliott, Aaron Jones, Marlon Mack, Tyreek Hill, Davante Adams, O.J. Howard, and Carlos Hyde and some big misses like Alex Collins, Christian McCaffrey, Matt Breida, Mike Evans, Keelan Cole, Kenyan Drake, and Lamar Miller. I think the only thing to do is to dive back into the research to see what else I can discover.